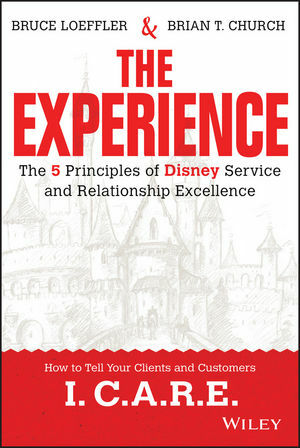 The Experience is a unique guide to mastering the art of customer service and service relationships, based on the principles employed at the renowned leader in customer experience ­— the Walt Disney Company. Co-Author Bruce Loeffler spent ten years at Disney World overseeing service excellence, and has partnered with Brian T. Church in this book, to show you how to bring that same level of care and value to your own organization. Based on the I. C.A.R.E. model, the five principles — Impression, Connection, Attitude, Response, and Exceptionals — give you a solid framework upon which to raise the level of your customer experience. You will learn how to identify your customer service issues and what level of Experience you are currently offering. You can then determine exactly what the "customer experience" should be for your company, and the changes required to make it happen. Customers are the lifeblood of business. A great product offering isn't enough in today's marketplace, where everyone's looking for an "experience.” Imagine the kind of value a Disney-level customer experience could bring to your organization. The Experience is a guide to getting there, from an insider's perspective.